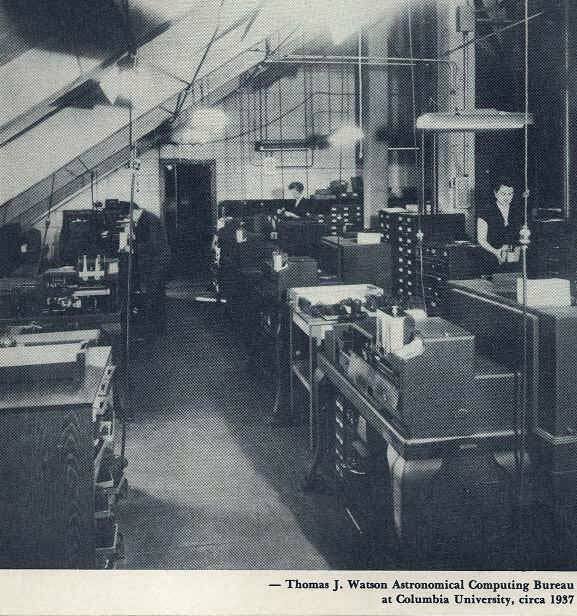 The Thomas J. Watson Astronomical Computing Bureau in the attic of Pupin Hall, 1937. Cover, CUCCA Newsletter, V13#6, 4 Nov 1981. In 1929, Columbia University Astronomy Professor Wallace Eckert was drawn to Ben Wood's new Columbia Statistical Bureau, full of IBM punched-card machines donated by IBM President Thomas J. Watson. After hearing about the pioneering work of L.J. Comrie in building astronomical tables using these machines in 1928, Eckert hoped to perform his own celestial mechanics calculations on them, but soon realized that he needed more advanced capabilities as well as machines he could use full-time. Wood arranged an audience for Eckert with Watson which proved as fruitful as Wood's own 1928 audience. Eckert had his eye on IBM's new 601 Multiplying Punch (1931), which Wood didn't have, but he also wanted some extra capabilities added. Watson put Eckert in touch with E.W. Baehne ; Eckert wrote the specifications and Baehne had IBM engineers implement them. The new machine, dubbed the Astronomical Calculator, as well as standard machines such as tabulators, were delivered to the attic of Pupin Hall in 1933, a gift from Watson. The result was the first permanent punched-card laboratory for scientific work. It was here that in 1933-34 Eckert designed a mechanism to automate certain kinds of lengthy computations, allowing them -- at least in principal -- to run to completion unattended, without the normal manual steps to move decks of cards back and forth between calculator, tabulator, sorter, etc. This was a giant step towards modern programmed computing. Eckert's lab was variously known as Rutherford Laboratory and the Hollerith Computing Bureau until 1937, when it became the Thomas J. Watson Astronomical Computing Bureau, sponsored jointly by IBM, the American Astronomical Society, and the Columbia University Department of Astronomy, to serve as a resource for the entire world astronomical community , making it the world's first center for scientific computation . The Bureau was devoted to defense work during World War II, such as calculation of artillery firing tables, while Eckert went off to the US Naval Observatory where he served as Chief Astronomer and Director of the Nautical Almanac Office, where he used the punched-card methods he developed at Columbia to produce the Air and Sea Almanacs used for all wartime navigation by American aircraft and ships. The Astronomical Bureau has been in constant use since early 1934 for pure science, except during the war years, when it was used for defence computations. In ten years of active operation, millions of figures have been processed, and many of the great observation programs in astronomy have been aided by the Bureau. One of the principal projects that was carried on was the preparation of a great star catalog [The Yale Star Catalog of Frank Schlesinger, Columbia PhD 1989]. The previous star catalog of its type was made about 1870; it was a joint project of all the principal observatories of the world and required their combined efforts for a generation. At the end of the that time a catalog was produced which gave the positions of some two hundred thousand stars, with measurements accurate to about seven places. [The Watson Lab computing and star measuring machines allowed the new catalog to be produced in a few years by a handful of people at Columbia and Yale.] Many other projects were carried out at the Bureau. They are of similar scope though different in detail.